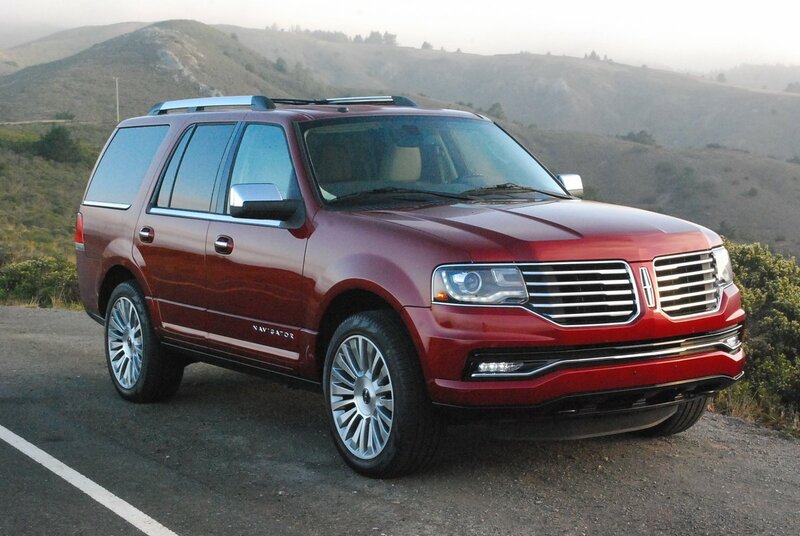 The Navigator is Lincoln’s effort to turn the Ford Expedition into a true luxury SUV. 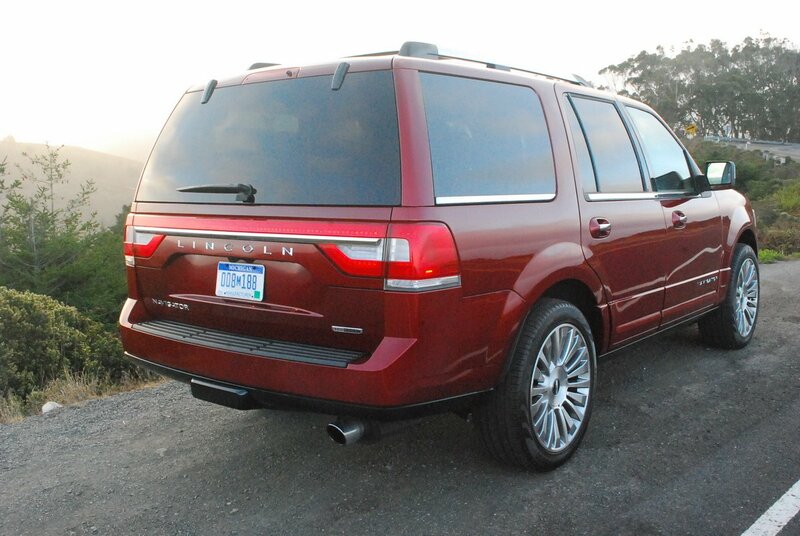 Since both vehicles weigh 6,200 pounds, share similar Eco Boost turbocharged 3.5 liter V6 engines, and 6 speed automatic gearboxes, what makes the $66,066 Navigator worth $20,000 more than the $46,315 Expedition? Call it panache, or the refinement of breeding, but the Lincoln name plate, which has long stood for excellence, does not disappoint in this instance. Our first drive in it took us home at night, When we flipped the key fob remote to unlock the burly SUV, the first thing we noticed were power deployed running boards tipping into place to facilitate cabin entry. The Navigator, after all, stands 78 inches tall, so step-in is no easy chore without running board assistance. The second thing we took note of was the large display of an illuminated Lincoln logo on the dark pavement on either side of the vehicle. This ingenious entry light system won our hearts over immediately. It really is a brilliant touch, unlike anything we’ve seen before. The good vibes continue once ensconced in the vast cockpit. We should point out that our test vehicle did not make do with base level equipment. Rather, it included pricey Equipment Group 101A ($6,850) which the window sticker would lead you to believe just adds 22 inch polished aluminum 20 spoke wheels and 285/45R22 Pirelli Scorpion Verde tires. Further research, however, indicates you receive much more than wheels and tires for your extra six thousand dollars. Specifically, the 101A Group also adds those useful running boards, upgraded premium leather low backed bucket seats, upgraded leather instrument panel, door panels and console, unique color headliner, upgraded Ziricote wood appliqué, and 2-tone exterior tuxedo black lower body-side moldings. All these niceties add up to a rather stellar looking package. The deviated light tan stitching across the sweeping chocolate dashboard looks fetchingly European. The seats are sumptuous front and rear, with myriad fine tuning available for back rest angle, lumbar support, heating and ventilation. About the only thing missing from the luxury index is a provision for memory retention of driver settings for seat, mirror and steering wheel position. This rig drives big, like a semi. You need to be real careful about where you position it in your lane, because its width of 80 inches does not allow much room for error. While the steering feedback is surprisingly accurate and informative, the sheer size of the Navigator demands your full attention. The Pirelli Scorpions are enormously effective at gobbling up the miles without jiggering the ride quality. Their vast 285mm tread snags a lot of pavement when you’re tackling winding secondary roads. While you’ll never forget the 3 ton bulk you’re commanding here, the Navigator never embarrasses itself in the handling department. And in the power department, Lincoln has found the magic key to make a fuel efficientV6 rival the large displacement V8 it replaces in the Navigator line for 2015. 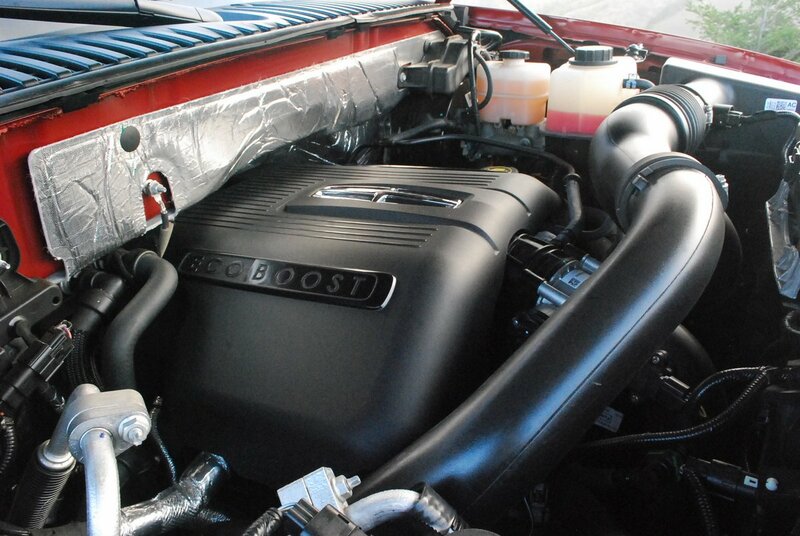 This turbo marvel, which you can barely see when you peer into the vast engine bay, produces 380hp and 460lb.-ft. of torque, more than enough grunt to tow 9,000 pounds of trailer with ease. 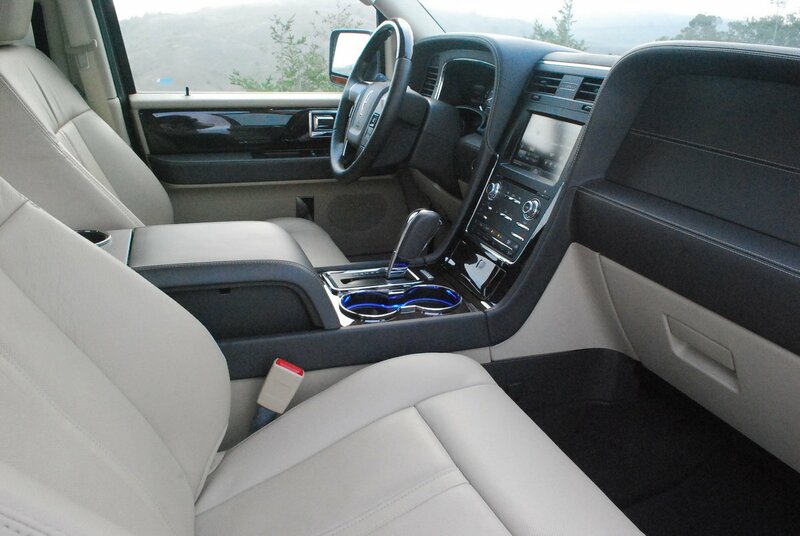 By comparison, the sibling Ford Expedition makes 365hp and 420lb.-ft. of torque, so in the power department you get what you pay for with the Lincoln. The Navigator’s exterior rear view mirrors are particularly generous in size, which makes them perfect for towing chores. Their lower edge incorporates directional signals, and you will find side traffic alert lights located on the outer edge of the mirrors. Trailer sway control is a welcome standard feature. The interior of this unit is so vast that most of the time you’ll wonder what to do with its 61.5 cubic feet of cargo space. New for 2015 are electrically folding second and third row seats, so transforming the interior of the Navigator from people mover to cargo truck is less of a chore than it once was. 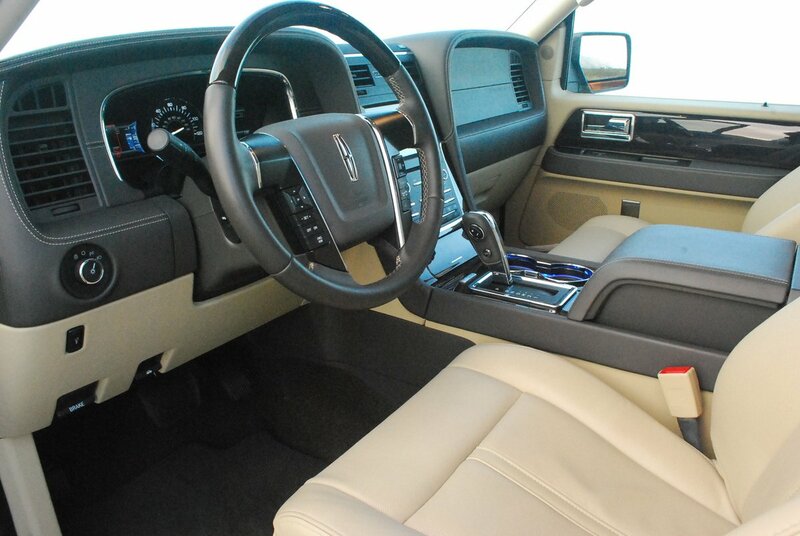 The console receptacle between the front seats is deep enough to accept a couple of six packs, so even small object storage is never a problem inside the Navigator. Compared to some newer luxury SUVs, the Lincoln’s music/operations interface (called My Lincoln Touch) seems exasperatingly involved and demanding, which should come as no surprise since Microsoft provides the dynamics. The only other niggle is the inside rear view mirror, which is so insubstantially mounted to the windshield that it vibrated like a tuning fork. Aside from those minor issues, the Navigator is without question the Cunard QE2 of the highway, regal looking in its optional Ruby Red Tinted Metallic Clearcoat ($495), magisterially towering above the flotsam and jetsam like a true luxury liner.